Do you think that your kid has it to head the Undead Glam Squad? If so, you need only pick up the Dead Man Rockin’ costume. The pullover shirt ensures that your kiddo is showing off a rockin’ sternum and ribcage. The fans will fawn over the jacket, though, with its studded lapel and shoulder spikes that make up a perfect image, complemented by a skull design belt buckle. 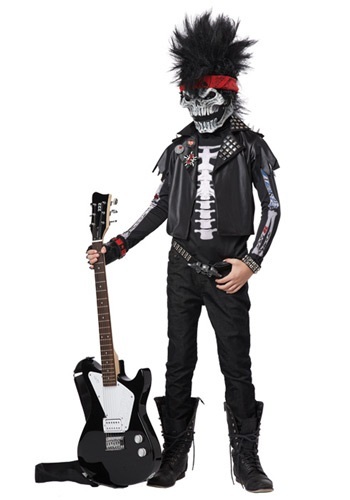 If that wasn’t enough of a hard rock look, the skullcap mask and dark-as-death Mohawk style hair and vivid red bandana will have the fans of this Kid Death Metal band seeing blood—and we’re informed that is a good thing. Still, despite the bone-thin appearance, we recommend a full and balanced dinner before your kiddo heads out to heads out to head-bang.